The repertoire for this CD of harp music, featuring the brilliant young Norwegian harpist Ellen Sejersted Bødtker, focuses upon French music for the harp, written predominantly during the early twentieth century. 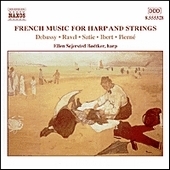 Four of the pieces are by Debussy, whose innovations in harmony and delicate use of the orchestra had a profound influence upon twentieth century music, while Ravel is represented by his masterly Introduction and Allegro for harp, string quartet, clarinet and flute, and an arrangement of his popular piano piece, the Pavane pour une infante défunte for harp and cello. Maurice Ravel wrote his Introduction and Allegro for flute, clarinet, harp and string quartet  in 1905, the year in which he was disqualified in the preliminary round of the important Prix de Rome competition, for which he was now entering for the fifth time. His career as a student at the Paris Conservatoire had lacked the expected distinction, in official eyes, although he clearly benefited greatly from the sympathetic attention of his composition teacher, Gabriel Fauré, which had persuaded him to return to the institution and even to continue as an auditor. L’Affaire Ravel, in fact, provoked a sufficient uproar to bring about a reform in the Conservatoire and the appointment of Fauré as the new director. By 1905, of course, Ravel held an established position among younger French composers and this he was to consolidate in the following years, rejecting the suggestion from critics that he owed so much to Debussy, although the two composers did, in some respects, exercise influence over each other. The Introduction and Allegro, familiar to older British audiences from its use as incidental music for the broadcast life of Christ, The Man Born to be King, by Dorothy Sayers, is relatively simple in conception but captures the spirit of the age and of a poetic national mood, a certain nostalgia for an unattainable past. In this only work by Ravel that uses the harp, he handles the instrument idiomatically in evoking a world that he had earlier explored in his piano piece, Pavane pour une infante défunte  (Pavane for a Dead Infanta), its title apparently an afterthought. He later arranged the Pavane for orchestra. The eccentric composer Erik Satie certainly exercised some influence over both Debussy and Ravel, as he did after 1918 over younger composers in the circle of Jean Cocteau. Described by Stravinsky as the oddest person he ever knew and at the same time the continuously wittiest, Satie was attracted in the 1890s to the teaching of a dissident Rosicrucian and subsequently established his own mock-religion, the Metropolitan Church of Jesus Christ the Conductor, appointing himself to a high position in the supposed organization, from which he was able to publish attacks on his adversaries. His Gymnopédies, the first of which is here transcribed , bear an inconsequential title derived from the games of boys in ancient Sparta and share the same feeling of gentle nostalgia, couched in the simplest musical terms. Claude Debussy enjoyed greater success than Ravel at the Paris Conservatoire, duly winning the Prix de Rome, after he had abandoned his original plan of embarking on a career as a concert pianist. His innovations in harmony and delicate use of the orchestra had an effect on the course of all music in the twentieth century. The piano piece Rêverie , written in 1890, was later unjustly deplored by the composer, who regretted its issue in 1905, when he had largely turned to other forms of composition. The two piano Arabesques, from the same period, the first, here transcribed for harp and written in 1888, have kept their place in repertoire. La plus que lente  dates from 1910. Written for the piano, it is effectively transcribed for violin and harp by Léon Roques. The well-known La fille aux cheveux de lin (The Girl with the Flaxen Hair)  belongs to the first set of piano Préludes of 1910 and has a charm of its own, summarised in its title, with correspondingly wide popularity. The two dances, Danse sacrée  and Danse profane  were written in the spring of 1904 and scored for chromatic harp and strings. They were first heard at the Concerts Colonne in November of the same year. The dances had been commissioned by Pleyel and were intended for competitions at the Brussels Conservatoire, where attempts had been made to study the harp of antiquity. There is a use here of early modal writing and, particularly in the second dance, a call for virtuosity, while both have more than a hint of Satie’s musical language about them, as heard in Gymnopédies. In Paris, it might be added, the works provoked criticism for a lack of formal structure and, strangely enough, for perceived dissonance. Jacques Ibert belongs to a younger generation of French composers. After the interruption of his student career by the war, he won the Prix de Rome in 1919, with its period of residence in Rome at the Villa Medici, where he returned in 1937 as director, a position he held for many years. His light-hearted Scherzetto  is one of six pieces for the harp dating from the later period of his war service. A pupil of Jules Massenet and of César Franck at the Paris Conservatoire, Gabriel Pierné succeeded the latter as organist at Ste Clotilde, later distinguishing himself as a conductor, notably as deputy and then successor to Edouard Colonne at the Concerts Colonne. His Impromptu-caprice , a well-known showpiece for the harp, starts with a cadenza, before the introduction of a melody of particular charm, which is to return in conclusion, after a livelier Bolero at the heart of the work. Harpist Ellen Sejersted Bødtker is a graduate of the Norwegian State Academy of Music, the Hochschule für Musik in Vienna, and Indiana University. She is well known in Norway, where she performs regularly with the Oslo Philharmonic Orchestra, the Norwegian Chamber Orchestra, and the Norwegian Radio Orchestra. She is also a member of the Oslo Sinfonietta and BIT 20, with whom she plays contemporary music. Ms Sejersted Bødtker has given numerous solo concerts, and has also performed as soloist in Scandinavian Orchestras. In November 2001 she gave a solo concert at St. Martins-in the Fields in London which attended by Their Royal Highnesses, The King and Queen of Norway. In December of the same year, she was invited to give a solo concert at a luncheon celebrating the Nobel Peace Prize. She has also had her own radio and TV-programs, featuring French and Spanish music. In 1997 she founded the flute and harp-duo Bella Polaris, and she was an active teacher in Oslo. The Naxos CD "French Music for the Harp and Strings" (8.555328) marks Ms. Sejersted Bodtker’s recording debut as a soloist.